Well, I can't say I was super impressed with either crowd. For whatever reason, the Raw crowd always seems louder to me every week. 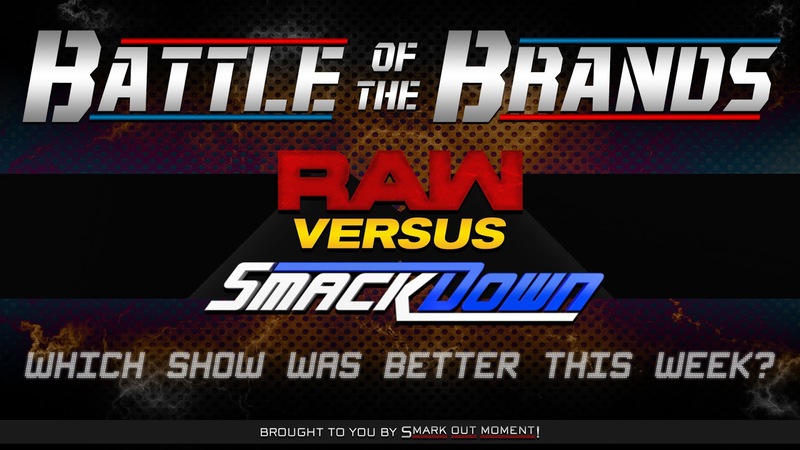 It's like they don't focus on it as much for SmackDown, or maybe there's some sort of noise added for Raw. Either way, they get the win again this week. For the last few weeks, both teams have felt rather flat to me. I don't know what "it factor" they're missing, or maybe they're just already growing old in my mind. I have such high expectations for commentary teams growing up with JR & King alongside Tazz & Cole on SD. Phillips and Graves are the closest thing we have to a true commentary team, but Byron gets in the way of that. Ditch the three-man teams. Let Cole & Byron handle Raw so Byron can get some more experience from one of the greats(I think he'll be good when he can get more focus, not in a three-man team), and let Phillips and Graves continue their NXT legacy on the main roster. Regardless, I'm taking Graves and Phillips even with the awkward third wheel of Byron. I enjoyed several matches this week! We'll start with Raw. Asuke beating Bliss is only a sign of things to come. She's basically already the champ, and we all know it. Joe & Reigns are money together. Their styles fit perfectly because they're two big dudes that just want to beat people up. Just like Cena, Joe brings out the best in Roman Reigns. Also, Goldust with the cruiserweights? I like it. The Bullet Club (kind of) is in WWE again! We saw The Good Brothers(Anderson & Gallows) with AJ for a while, and now they seemed to have teamed up with Finn. And I'm all for that. They took out Elias, my personal favorite alongside Strowman, and The Miztourage. SmackDown had some good stuff too. The Tag Team Championship action was awesome, even though everything else about it sucked. That main event was awesome too. Sami & KO are gold together and throw in one of the greatest ever with AJ it is bound to be perfect. Not perfect enough to take out Raw. It was a bleh week for promos. Almost to the point, I don't want to award either side for anything. Kurt Angle pointlessly came out to explain that, shockingly, the women's rumble will be the exact same as the men's. Nia Jax & Enzo is a weird combo but has potential. I'm interested to see how Kane and Strowman carry this feud into the Rumble with Lesnar being absent week in & week out. Really, nothing worth watching. Same goes for SmackDown. Bryan & McMahon talk about the main event later. Which... Why? It wastes time in my opinion. However, New Day along with Rusev and Aiden English probably had the best promo of the week in terms of entertainment value. So thanks to them, they get the win. The most important part of sports entertainment. Which show has the best storylines? The women's division cares about one thing and one thing only, the Women's Royal Rumble. So all women who aren't champs, care about that only. Really, that's all anyone cares about. We all want surprise entrants, and we all want to see who the golden pony is that has been picked for WrestleMania. As for title pictures, Joe and Roman are making the IC Title a fun ride. I love their styles together like I mentioned before, and Roman as IC Champ for a bit is fun. Even though The Miz is missed dearly. Jason Jordan and Seth need to lose the titles, and Jordan needs to do something else. We all need to forget he is Angles son. Talk about pressure. Even though I'd rather see Strowman go one on one and beat Lesnar for the belt, I guess Kane being the scapegoat for Lesnar to beat is better than Strowman losing straight up. Also, Finn and Anderson & Gallows are back! Anderson and Gallows should be tag champs, and Finn is a front-runner for the Rumble win. I'd love to see them run the show for a bit. I am loving this essentially a heel but not really a heel Daniel Bryan. Everyone in that scenario is over like Rover right now. KO & Sami, AJ, Daniel, and Shane are having a killer storyline that may be my favorite right now. I wouldn't mind seeing Shane & DB go at it at WrestleMania either. I'm still confused as to why Ziggler just gave the title away, but I'm sure he'll come back by the end of this tourney. Either way, I want to see Roode win this thing. Why they did what they did with the Tag Titles this week, I'll never know. Why the ref decided to say something about this illegal opponent now is odd. This sets a precedent that whenever someone cheats and wins a ref should come down and play it on the board to change the outcome. However, the main event handicap scenario that involves Bryan is probably my favorite going. That helps SD get the win. Braun, Kane & Lesnar, and Finn & The Good Brothers! The main event helps SD get the win here. KO & Sami are proving their worth more and more every week, and AJ is proving he should've been WWE's boy long ago. He is the face of the business right now, and not just WWE. He is the face of pro wrestling and sports entertainment. He is carrying the torch, and will for the next several years. Raw has a lot going for it, but Lesnar needs to drop the belt. There needs to be a change, and the Universal Championship needs to be on the show every week. SmackDown gets the narrow win 4-3.